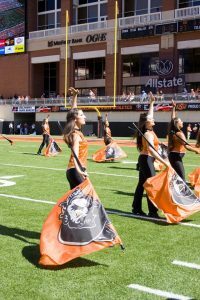 The Cowboy Marching Band is seeking a dynamic, experienced color guard instructor for the 2019 season. The ideal candidate will assist with the administrative responsibilities of running the guard, write routines that are appropriately difficult for up to six halftime shows per year, teach the work to the guard members, run our guard audition days, and work with CMB directors as a member of the marching band staff. This position is paid as an outside contractor, and receives certain perks such as traveling with the marching band (when your schedule permits), attending home football games, and others. We will begin reviewing materials on February 25th, 2019.